Please use promo code "LGRAFT" to receive the discount. The business code "LakeGeorge.com-14940" does not apply. Organize a group of 8 or more and you go FREE! Get $25 Off your order of 12+btls OR get $10 Off your order of 6+btls! Valid in-store only. Not valid online. Applies to standard, 750ml regularly priced bottles only. Cannot be combined with any other sale offer or discount. Save $1.00 Off each Adult Admission to Natural Stone Bridge and Caves Park. Good all year (Winter & Summer). One coupon per family and cannot be combined with any other offers. 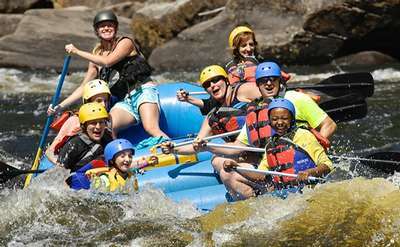 $5 off per person on the Hudson River Gorge rafting trip. Coupon code to redeem this offer is "LG2018"
$10.00 off per person in your party for a White Water Rafting Trip down the Hudson River with Beaver Brook Outfitters.